Dr. Arkady Naiman, a well respected dentist with more than thirty years experience, is very proud to offer the highest quality dental care to his patients at Advanced Dental. 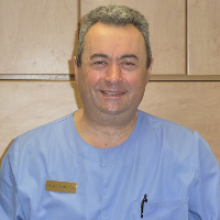 While he is expert in all aspects of patient care, Dr.Naiman has a special interest in prosthodontics (crowns, bridges and dentures) implant dentistry and oral surgery. I used to always be afraid of the dentist, but thanks Dr. Naiman I”m not anymore. He is very kind and always makes sure I’m comfortable. He has the best staff, from the receptionist who always has a friendly smile on her face, to everyone else who worked with me and was very caring. As long as I live in Plainville, Dr. Naiman is going to be my primary dentist. I love this place! I have been afraid of the dentist for years because of a bad experience in the past, so I hadn’t been in a long time, but this place helped me get rid of my fear. I had a cavity but Dr. Naiman made me feel comfortable while he filled it. I also had a cleaning done, and that went well too. He prescribed me a pill so that I wouldn’t need laughing gas. Yay saving money! Thank you so much, this place provides excellent dental service. I love this staff! I’ve seen a lot of dentists in Plainville, MA, but this is the best office I’ve ever been too. I’m very happy I found this place. The hygienist gave me a lot of tips to improve my dental health that I would’ve never realized. The office was very clean and had the latest and greatest in technology. There was zero waiting time. I would recommend this place to anyone! Unlike dental insurance, a direct dental plan with Dr. Naiman and Doctors Network is a membership that gives you access to significant discounts on almost all of our services. Everyone can join for a low monthly fee of $34.99 and a one-time activation fee of the equal amount. The cost of membership is typically a fraction of most dental insurance premiums. Patients who sign up for a direct dental plan through our office in Plainville can attend routine preventive exams and cleanings for only $25 per visit. This includes X-rays, when necessary, and the cost does not change no matter how many times you visit per year. When cosmetic or restorative treatment is required, the costs of your treatment will be discounted by up to 90%, including fillings, dental crowns, dental implants, Invisalign® and more. Dr. Naiman, our team, and the experts at Doctors Network share the common goal of making dental care simpler, more affordable, and more attainable for all of our patients. Please note that a direct dental plan is not insurance, and is not designed to replace your existing coverage. We offer this direct dental plan to help reduce your out-of-pocket expenses and therefore maintain your oral health. If you have questions about Doctors Network, or are ready to sign up, then contact Dr. Naiman at Advanced Dental Care today, or call Doctors Network at 1-866-800-3168. General dentistry is as important to your smile as taking care of your teeth at home. For instance, preventive exams and cleanings are necessary to avoid dental issues such as tooth decay and periodontitis. At our Plainville, MA dental office, Dr. Naiman and our team offer an array of general dental procedures to help you enjoy a lifetime of healthy smiles. In all aspects of your health, prevention is the best medicine. Therefore, the primary focus of general dentistry is preventing dental diseases from developing. Besides keeping your teeth clean with good hygiene, professional dental cleanings and check-ups help stop the accumulation of oral bacteria into plaque and tartar. Other treatments, such as scaling and root planing (deep cleaning), bone and gum grafts, dental extractions, and more, can also help you manage existing issues before they worsen. At your general dentistry appointment, your dentist will thoroughly inspect your teeth and oral tissues for signs of trouble. If any are present, then he or she will consult with you about appropriate treatment options to stop the problem from growing worse. However, ensuring a lifetime of healthy smiles will still rely on ongoing general dental care. Schedule a Visit with Your Plainville General Dentist Today! With a strong focus on prevention, preventative dentistry is essential to maintaining your good oral health. To make an appointment, call Dr. Naiman's dental office in Plainville, MA today at (508) 695-7674.